a black square denotes the starting point. a hook denotes the exit of the labyrinth (that's where you get pulled out). you can collect gold nuggets (the round things). you can go a way forth and back, but not more than that. arrows may guide you to the exit. 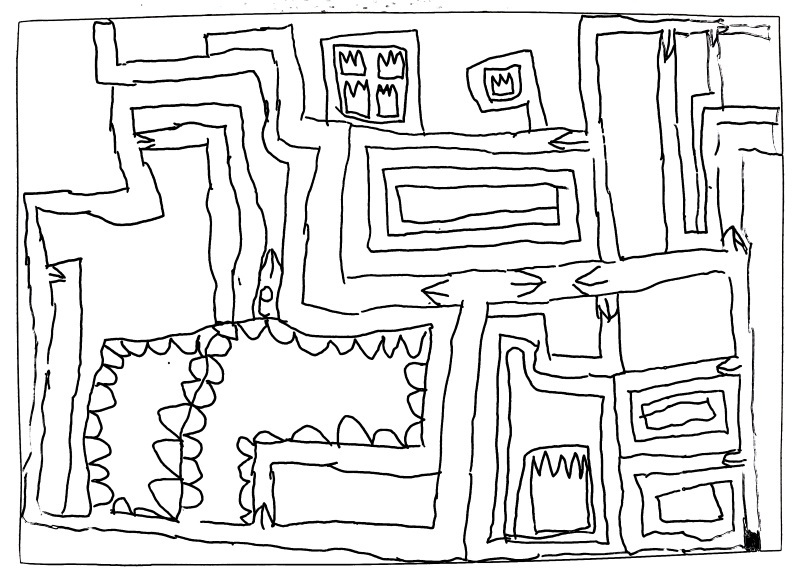 (If he paints a labyrinth for me to solve, they are often misleading). Maybe you know, at the age of 4, kids start telling porky-pies and sometimes he does not follow his own rules, especially if he finds out that he cannot reach the end of the maze any more. That's where you come into play: since I'm looking for games for kids anyway, you turn his idea into a game where cheating is not possible. the playing field is a n*m rectangle of equally sized squares. a square can have 0 to 4 walls, one on each side. a crown is worth 50 points. a gold nugget is worth 20 points. walking on a square that has already been walked subtracts 1 point. the player can walk in 4 directions, except if there is a wall. Input device can be anything. Please consider keyboard support. The labyrinth must be solvable. I.e. it must be possible to reach the hook from the starting point and it must be possible to collect all the valuables (even if that does not result in the highest possible score). If the player gets stuck, the game ends. The player must not die by falling off the board. You may put a wall around the complete maze or wrap around edges, whatever you like. the program takes an word (0-65535) argument as input. This is the seed for the random number generator. Calling the program with the same seed again results in the same labyrinth. calculate the maximum points that can be collected. Consider that due to -1 points it might be better to not collect all items. This is a popularity contest, since I want to be able to read and understand the code and perhaps adapt to new ideas of my son. Sorry, code golfers, maybe you want to create a copy of this question with rules more suitable for golfing, e.g. a console version with all the characters defined. The most popular game on 3rd of May will become the accepted answer. And, hey, why not publish it in an app store? Work in progress. Unfortunately the maze is not always solvable - the limit on back-forward is the real hurdle. The process of creating the actual maze uses the depth-first search algorithm, but with an iterative approach. Here's how it works. It's easy to see that the -1s in the array represent walls, and the 0s and 1s are corridors. Items are randomly distributed throughout the maze. The red ellipse is the "player" that you control. The maze is wrapped in a scroll pane for convenience so that if the size exceeds the frame's maximum size you can scroll to see the rest of the maze. I'd say the only problem with this is how the end of game check is carried out. I thought about several ways to go about doing it, but I ended up resorting to hard-coding it all. I'm open to suggestions on how it can be done. I realize I'm late for the party, but here is my take on this challenge. I went text based as I haven't gotten around to learning pygame, yet. It is Python 3. 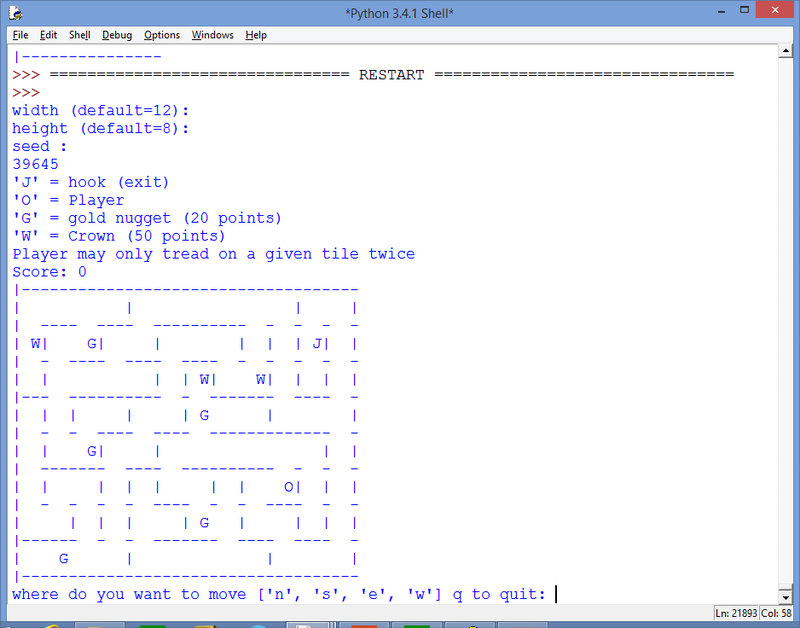 Change input to raw_input and it should work in python2 also. The Hook (exit) is represented by "J". "W" is crowns (50). "G" is Gold nuggets (20). 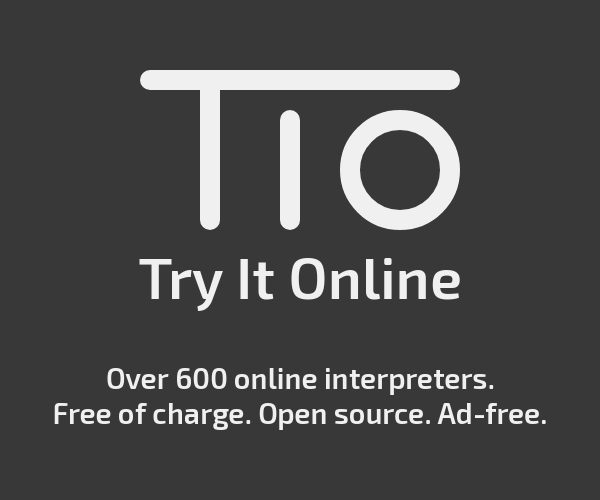 The Player is "O". I experimented with using "P" for the player, but I found "O" easier to Identify. 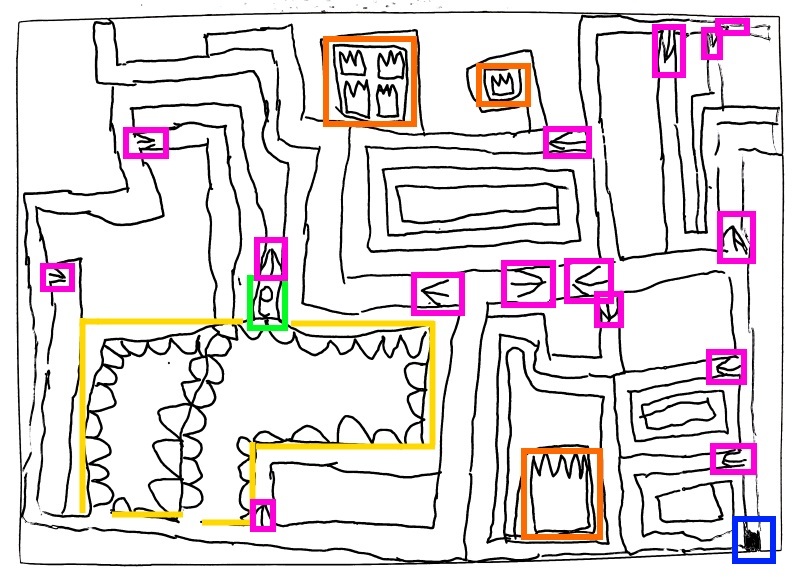 I used standard depth first maze generation, then add the gold, crowns, hook, and current player position. I did not implement the criteria that all treasure can be obtained. Not the answer you're looking for? Browse other questions tagged popularity-contest game board-game or ask your own question.